If you use a GPS System to find your way to our winery, you may need to type in an address of 3150 S. Rocky Comfort Rd., Anna, IL 62906, even though our true address is Makanda, IL. For unknown reasons the Anna address will lead you directly to Blue Sky Vineyard while our Makanda address takes you only partially to our facility. We apologize for any confusion this may cause. Please do NOT use iPhone maps for directions to our winery. The information they provide is INCORRECT and will send you to a location approximately 1 hour from our proper location. 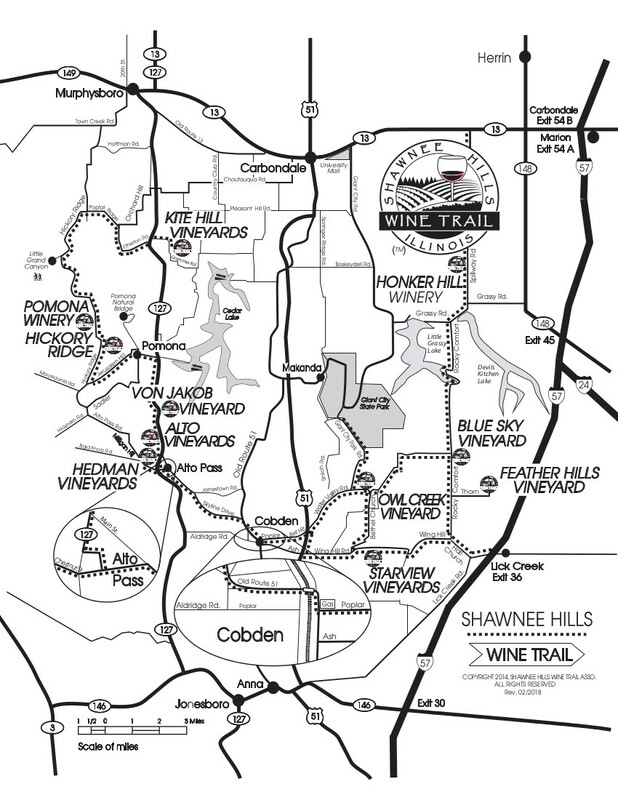 Our winery is located in Makanda, IL and is approximately 1 mile from Feather Hills Vineyard & Winery: 410 Thorn Lane, Makanda, IL 62958. Make a left on Grassy Road. Proceed 1.9 miles to a Y intersection. Keep right. Proceed 2.8 miles to the vineyard on the left. Proceed .4 mile to stop sign.